Get the fastest mobile browser with Opera Mini. 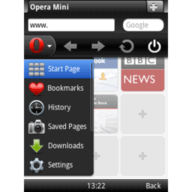 By compressing pages with Opera's servers, Opera Mini not only loads webpages faster, but it saves on data charges since it uses about a tenth of the data of normal browsers. Opera Mini is the ultimate browser for browsing on slow Internet connections.